This smart alarm clock wakes you with gradually increasing music, softly rising light, a 100% charged phone . . . even a weather and traffic forecast. Beddi syncs up to your device to offer a whole host of other features, too—from playing music to generating white noise, and calling you a cab. Customize it to suit your morning routine. Dimensions: 8.55" x 2.13" x 5.12"
We are still learning to use all the functions. Love the light feature on the bottom. I received this product as a gift after seeing it here. It looks amazing, but sometimes looks can be deceiving! Initially this product worked well, but I soon found out that there are too many bugs within the app that make this product more annoying than useful. I went to the product website and found that there is a firmware update that has to be done through the computer and not the app. I was happy to hopefully have a fix, but when I click the link to the firmware update, I'm redirected to 'page not found', grrrrr! Start your A.M. off right. 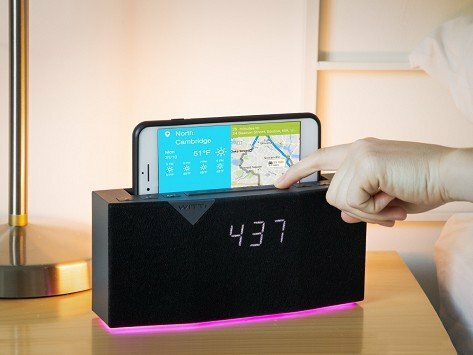 This smart alarm clock wakes you with gradually increasing music, softly rising light, a 100% charged phone, and even a weather and traffic forecast. Beddi is loaded with functions you can customize to kick off the day—and to wind down at bedtime, too. Set the built-in speaker to tuck you in with some white noise. While you’re sleeping, Beddi can hold and charge your phone plus two other devices, so you’ll wake up to fully powered batteries. Maker Alfred Wong created Beddi with a library of options and made it really easy to customize. Take the snooze button: if you’re more of a traditionalist, personalize a button to press snooze like a standard alarm. Or if you’re more tech-savvy, sync up your phone to activate snooze. You can even use your phone to play Spotify music and control other smart devices around your home, like your thermostat or lights. From calling you a cab on the spot to letting you set mood lighting—you can program your morning (and your evening) just the way you like it.